But this episode hopefully will prove you wrong and get you inspired to at least thinking outside the box. 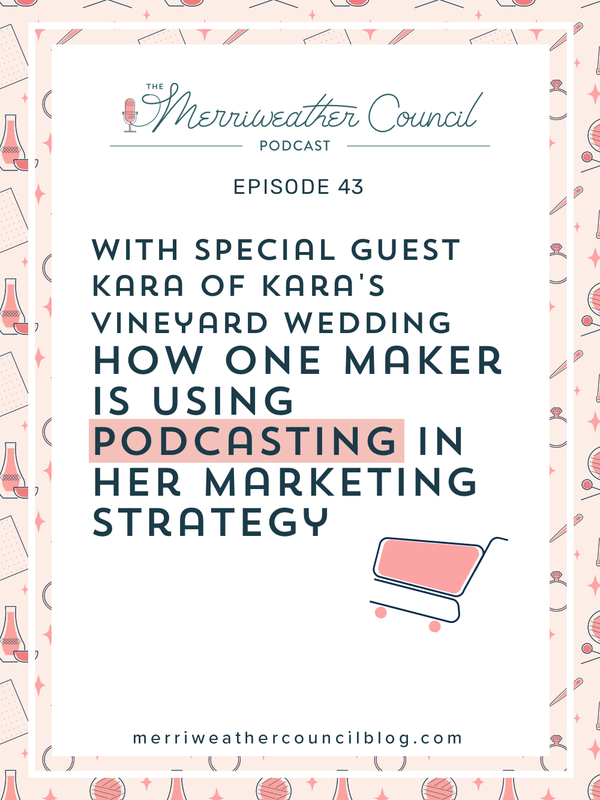 I had an amazing discussion with fellow handmade business owner, Kara Lamerato or Kara’s Vinyard Wedding, all about podcasting as a way of marketing her product based, handmade business.. YES, you heard it right, podcasting. Several years ago I met Kara through my good friend, Jen. Kara is a huge inspiration to me and I think she will be to you as well. Not only does Kara run a profitable product based business (handmade, of course) she ALSO created a podcast to support and advertise her business. That inspires the crap out of me. It’s not every day you hear of product sellers creating podcasts to support their marketing efforts. Product sellers tend to gravitate to tools like Instagram, Facebook, etc. And I’m always encouraging people to think beyond that, but even I would not have thought that a podcast would be a great tool for a product seller. Kara has proved that it is! In this episode you will hear Kara and I discuss why she decided to start a podcast, how podcasts can help makers and what her podcast has done for her and her business. We also spoke about Kara’s love for Pinterest, the idea of casting a net and the numbers behind podcasting. Kara also shared some information on starting a podcast and how she did it for herself. Be sure to listen for Kara’s tips for podcasting and the questions she thinks you should ask yourself before starting a podcast if you are now considering it! Most importantly – What else is going on in their lives? Are they dating? Getting married? Having children? Do they love to cook, travel, hike, camp? Working in the corporate world? Stay at home moms? Handmade business owners? FIND YOUR NICHE – Put yourself in their shoes so much so that you know what they would want to listen to or learn more about in their free time – that’s your podcast idea. If you can’t get this narrowed down to a very specific niche, you’re going to have trouble creating content that truly speaks to your audience. NICHE & AVATAR ARE NECESSITIES! Do YOU personally have the time to dedicate to content creation and production? Growing and nurturing an audience can only happen with consistency, so it’s very important that you are honest with yourself about this. Podcasts can be weekly, bi-weekly, even monthly, but you need to honor the schedule that you promise to your audience. Are you willing to pivot? In my experience, podcasting has been about trial and error since day one, and the flexibility and willingness to scrap an idea and start over has been key to long-term success. Can’t wait to hear your thoughts on this one! Enjoy!